1. Attach candy to their invoice. Everyone loves candy! Alright, not everyone, but most people do. Next time you send a paper invoice to your customers, staple candy to it. 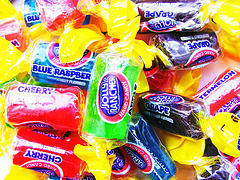 I recommend a Jolly Rancher or a 25 cent pack of gum. Tootsie Rolls are also good, but chocolate melts. If you don’t use paper invoices, find another creative way to give them sugar. Maybe leave a fresh baked cookie on their doorstep with a note so they know it’s from you. When you’re asking someone to pay you, you should remind them why they’re paying you. It’s because you do the little things that make them happy. 2. Give them a friendly call. The next time you have a few moments, give one of your customers a call. And call them for no other reason but to let them know how much you appreciate their business. if they have plans for the weekend. People love to talk about themselves, their experiences and their plans. By randomly giving them a call, you will be the person who lets them do just that. It’ll be a pleasant reminder that you care about them as your customer and as a person. 3. Send them a thank you card. Nothing says ‘thank you’ more effectively and less expensively than a hand-written thank you card. Next time you have five minutes and 44 cents to spare, write a short, appreciative note and mail it to them. More than likely, your customers receive a great deal of bills and direct mail. Meaning, your thank you card will stick out like a rose amongst weeds. Think about the simple things that make you happy. More than likely, these are the same things that will make your customers happy. And when you come up with a clever idea, make sure you act on it. If you enjoyed this post and/or found it useful, you should get JuniorBiz by Email.